Put the rice and 1 3/4 cups of the stock (400ml) in a saucepan and bring to a boil. Cover, turn down the heat and cook for 8 minutes, then take off the heat and set aside. Coat the bottom of a large skillet with olive oil and heat on medium high until hot. Season both sides of the chicken pieces with salt and pepper, and then brown, in batches, for 5 minutes on each side. Set the chicken aside on a plate and cover with foil. Add the onions and shallots to the pan, season with salt and pepper, and saute for about 15 minutes, stirring often, until softened. In another dry skillet toast the spices over medium heat for a couple of minutes, keeping them moving the whole time. Take off the stove and grind them in a small food processor. Add the ginger and garlic and process together into a rough paste. Add the paste to the pan with the onions, along with the cashews and saute for 3-4 minutes, stirring almost constantly so the garlic doesn't brown. Stir in the almond meal, yogurt, turmeric, currants, lemon juice and zest, along with the rice, and combine everything well. Add salt and pepper if necessary. Now you will layer the rice and chicken in a large casserole dish. Start with 1/2 of the rice, and nestle down 1/2 of the chicken. Add the rest of the rice and chicken, and arrange evenly. Add the rest of the hot stock (make sure it is hot) and pour over the casserole. Cover with a clean dishcloth and cover tightly. Bake for 30-40 minutes, or until the chicken is cooked through. This will depend on the size of your chicken pieces. If you have a thermometer it should read 160-165F. 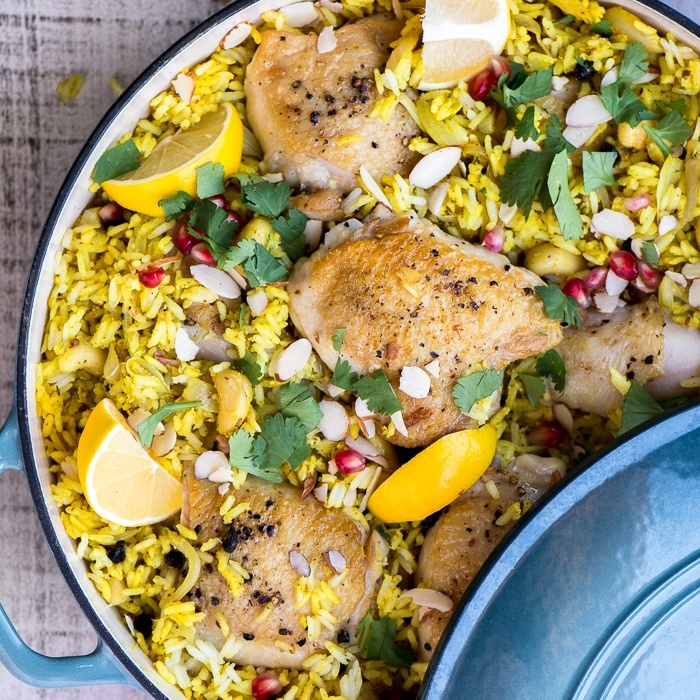 Fluff the rice a bit, rearrange the chicken, and garnish with the almonds, coriander leaves, and pomegranate seeds. I like to serve with a few lemon wedges on the side, too.